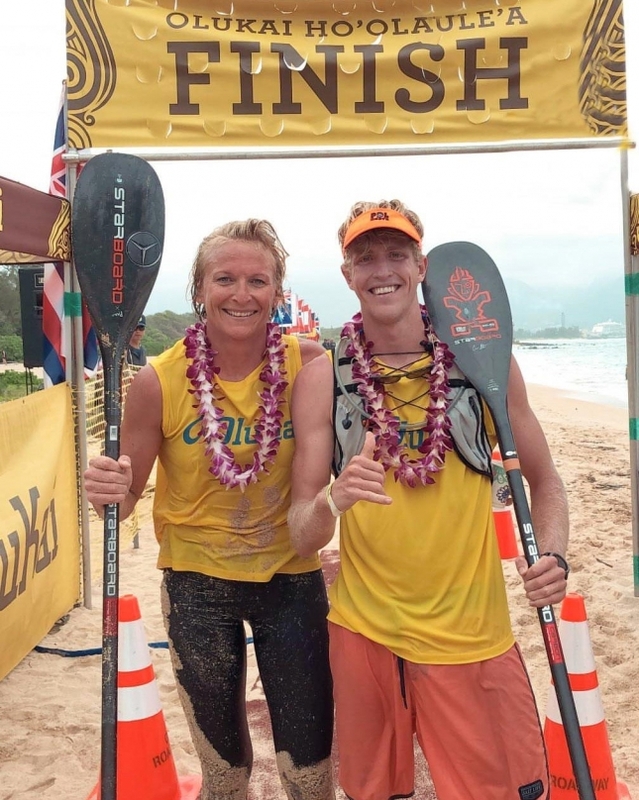 Connor Baxter and Sonni Honscheid have reclaimed their OluKai crowns in tough conditions on Maui today, with light winds and big seas providing a mighty challenge for both competitors and organisers of the 10th Annual Ho’olaule’a, the third stop of the 2018 Paddle League World Tour. 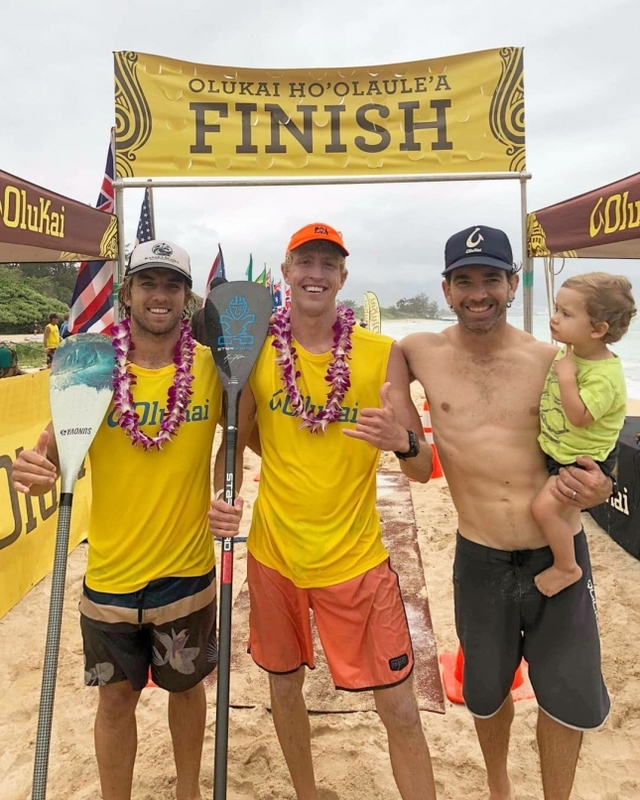 Connor held off a four-pronged Aussie invasion to defeat defending champ James Casey, perennial OluKai bridesmaid Travis Grant, dark horse Ty Judson and ocean master Matt Nottage to secure his sixth OluKai belt and restart his World Title campaign after disappointing results in Carolina and Tahiti. But while Connor is virtually unbeatable on the world famous Maliko downwind run when the bumps are firing, the number one seed had to fight hard to scrape out a win this time round: After the race was postponed from Saturday to Sunday in hopes of better conditions, continued rain squalls completely killed Maui’s signature trade winds and turned the 8 mile course into an absolute grind, with Connor’s winning time of 1 hour 12 minutes sitting 25 minutes outside his course record. The tough conditions just made victory all the more sweet though, with Connor and Sonni all smiles after completing the now-customary “Superman” winners’ dives over the finish line. Sonni was in a league of her own once again today, with the German powerhouse extending her lead on top of The Paddle League World Rankings after similarly-dominant displays in Tahiti and Carolina. Is anyone going to catch her this year? The win matches Sonni’s victory at OluKai 2016 and puts her in a very strong position to make it four-straight EuroTour crowns as the world heads to Europe next month. Though before she flies home, Sonni will have one more shot at the Maliko run in next weekend’s Paddle Imua regional charity event. Molokai champ Penelope Strickland gave it her best today but was missing her favoured ocean conditions, finishing just over five minutes adrift in the runner-up spot, while local young gun Annie Reickert gave the home team a podium position. Japan’s smiling assassin, Yuka Sato, continued her impressive early season form by claiming fourth, while California wunderkind Jade Howson rounded out the top five. While the wind was light the ocean was very much alive today, with big seas causing trouble at both the start and finish. Just getting out at Maliko Bay was a mission, while coming back in through the outer reefs at Kanaha Beach was simply described as “Sketchy” by one of the top finishers. At least one broken race board was spotted, though fortunately no reports of injuries have come through. The race has literally just finished but here are the early results. Check back later for photos, videos and full results. Big thanks goes to the OluKai crew for making this event happen rain, hail or shine for the 10th year in a row. You can also follow the @paddleleague on Instagram for behind-the-scenes Stories.